Inbound marketing is a fun and creative way to market your products or services. It has many aspects to it, and many ways how it can successfully be done to get the results you want. In this post, we will explore the fundamental process that you can implement as part of your inbound strategy. It is simple, easy and adds real value to your marketing. This 4 stage process is the fundamental framework you can build around your inbound marketing strategy. Each of these stages can contain multiple sub-stages or sub-categories. This can evolve later, so when you start building out your inbound marketing, focus on keeping it simple. In the Attract phase, you will use content to inspire, educate, entertain and offer value. You can use content that lives on your site, your social media profiles or YouTube channel. The purpose of this content has to be to drive traffic to your main digital assets, typically your website. Here your visitors can find even more content. This content will build trust in your brand. Once enough trust is build for an individual visitor, which should ideally happen in the first session, you need to ask them to leave a trail (cookies, email addresses, email addresses, some basic personal details, etc.). Offer something of even greater value for free. This offer is called a lead magnet and helps you convert visitors into leads. This is a crucial step, where you gain permission of your visitor to keep in touch and market to them. 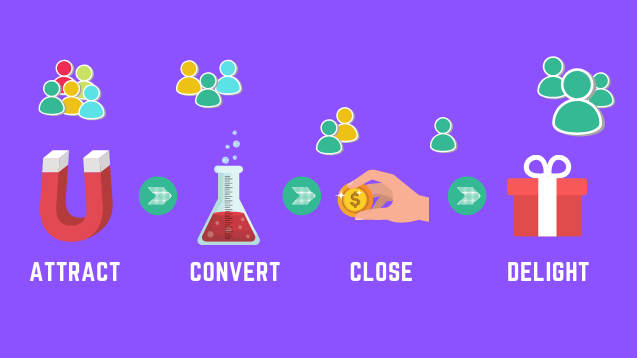 Between the lead conversion and the first purchase, a variable amount of time will pass by, depending on your industry and the type of products you are selling. During the Close phase, you need to gradually progress your leads. This can happen in multiple phases, where your build trust with authenticity, reliability and offering great value. Once a lead becomes your first-time customer, your relationship gets into the most critical phase. This is the Delight phase and not enough online marketers put great effort into this. You want to make sure, that your customer the happiest and most satisfied customer in the world. Make sure you deliver on your promise and provide great after sales service, customer service and customer success management. Good inbound marketing is a way of doing business with a positive difference. Not interrupting, but helping out and offering a great customer experience should be your motto at every stage of the marketing process. If you do it well, this will take care of generating income and build your brand’s equity. This post is a live post and will be edited, updated and revised from time to time.